Jim Gordon Productions (JGP) is a full service production company that produces special events, sporting events and corporate events. Jim provides the both the creative vision and technical tools to make an event have impact and be memorable to the guests and attendees. Jim specializes in scenic video projection to produce stunning “virtual sets” to provide a strong backdrop for any type an event or party. This is one of Jim’s signature production services. With the use of video and large format projection, JGP’s creative team produces larger than life images to support the theme or speaker of the event. Add great lighting, video, audio and staging services and JGP produces events that visually support the theme and purpose and highly entertain both the client and their guests. 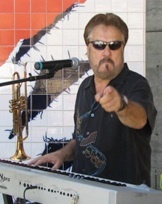 Jim Gordon has been both a successful musician and producer for over 30 years with an impressive track record of producing events that are truly memorable and unique. Jim has a very popular band The Groove Kings who won the KFOX Last Band Standing Contest and were voted “Best Cover Band” in the Bay Area. Jim is also the producer for the ShowTime Strikeforce Mixed Martial Arts Broadcasts and creates the high impact environment for the live event broadcasts on Showtime. Jim is well known in the sport of Mixed Martial Arts as one of the best producers in the world.